Ali, S.A., et al. Giant Intra-Ventricular Calcified Meningioma in Childhood Manifest as Movement Disorders: An Extremely Rare Presentation. (2017) Int J Neurol Brain Dis 4(1): 1- 3. © 2017 Ali, S.A. This is an Open access article distributed under the terms of Creative Commons Attribution 4.0 International License. Meningioma is considered as distant differential diagnosis in intraventricular tumour especially in pediatric age except for few published case reports. Its clinical presentation as movement disorder which improves after few months of surgery is even a rare manifestation of disease. 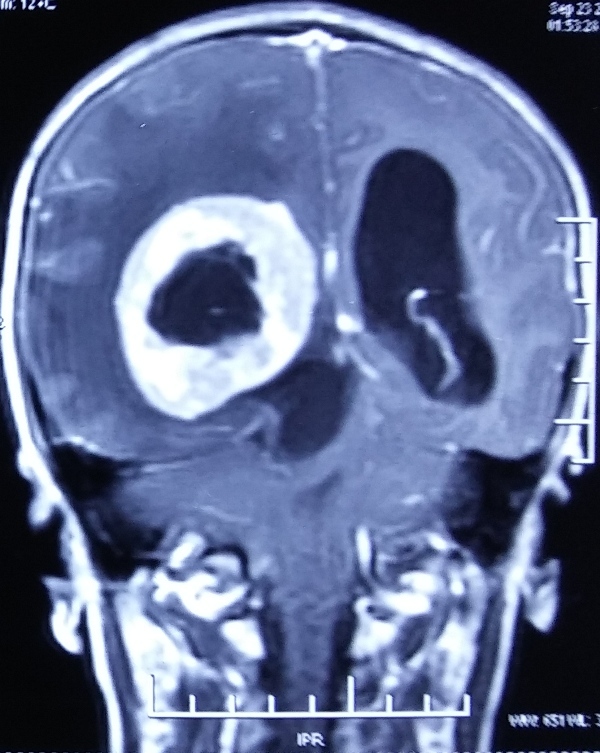 We present a case of giant intraventricular meningioma of more than 5 cm in eleven year old boy who clinically manifested as involuntary non rhythmic, non-repetitive, abnormal movements on left side of body which never reported before. These are quite challenging cases for surgeon. A 10 years boy presented with abnormal movement of left half of body which used to aggravate on motion from last 2 years. Abnormal movements were started in upper limb followed by lower limb and progressed from distal to proximal in limbs. These involuntary movements are irregular, non-rhythmic; non repetitive in left half of body with slow writhing movement of fingers and toes on left side. Importantly, these unsynchronised movements which were more on left upper than lower limbs and more aggravated on holding object or during other physical activity. These movements gradually worsened and progressively hampering his routine activities. The arm was involved more than the lower limb. On examination, higher mental function and cranial nerves were intact with mini-mental score was 26/30 except bilateral papilledema. The muscle tone was more on left side as compared to right side. No other neurological deficit other than gait swaying on the left side during walking. Reflexes were within normal limit except left plantar extensor. Contrast CT head (figure-1,) revealed a large giant calcified intra-ventricular hyperdense mass enhancing on contrast. Gadolinium MR contrast study of brain (figure- 2) showed right ventricular mass of size 5.8 * 4.6 cm which was isointense on T1 and T2 with enhancement on gadolinium and compressing ipsilateral basal ganglia and pushing subthalamic nuclei with extensive surrounding oedema with midline shift of more than 5 mm. Left ventricle was dilated more than right due to obstruction of foramen of monro. Right parieto-occipital craniotomy and tumour excision was done via trans-sulcal approach. Giant meningioma of size 6 * 4.5 cm which was hard, calcified, whitish tumour, occupying most part of right lateral ventricle with CSF around it. 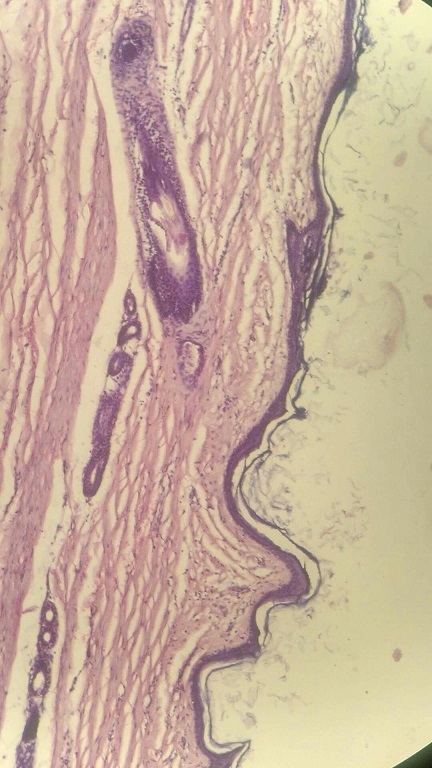 Tumour was attached to choroid plexus near trigone. Post-operative CT head (figure-3) showed complete excision of lesion. Histopathology (figure-3) showed meningothelial meningioma WHO type 1. At 3 months follow up patient was neurologically intact with disappearance of all abnormal movements on left side of body. 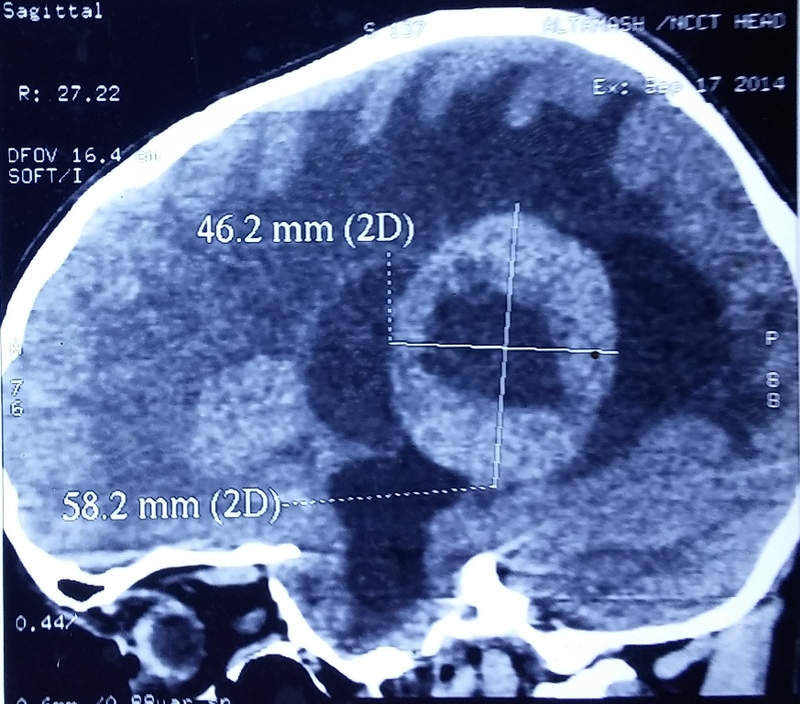 Figure 1A: Non contrast CT brain saggital view showed large hyperdense spherical mass with hypodensity in the central with ventriculomegaly. Figure 1B: Contrast CT brain axial view showed contrast enhancement with central hypodensity with extensive oedema and prominent surrounding vessels. Figure 2A: Gadolinium MRI imaging Brain, T2 weighted image showed intraventricular isointense mass with hyperintensity in central part and arrow showing pushing of sub thalamic portion of basal ganglia on contra-lateral side. Figure 2B: Gadolinium MRI coronal view showed completely filling of lateral ventricle and central hypointensity with enhancement of thick capsule. 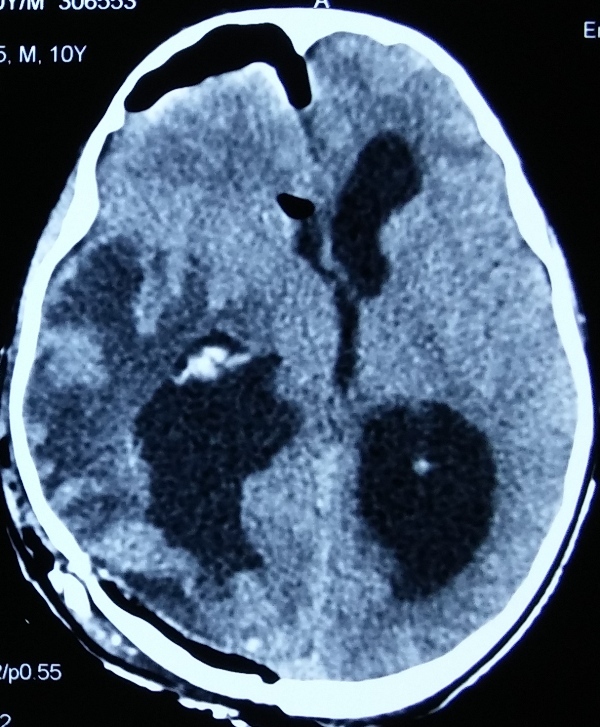 Figure 3A: Postoperative CT brain showed complete excision of tumour with surrounding oedema. Figure 3B: Histopathological slide showing. Primitive neuro-ectodermal tumour, astrocytoma, choroid plexus papilloma are common ventricle tumours in lateral ventricle in childhood. Intraventricular meningiomas arise from choroid plexus has an incidence of 0.5 to 5% of all intracranial meningioma however very rare in pediatric age group. Only three case reports are found in searched literature but none present with this type movement disorderm. Childhood meningioma differ from adult age as they have male preponderance, aggressive tumour biology, atypical location, more chances of recurrence and sometime associated with neurofibromatosis, They are frequently cystic in nature during childhood contrary to this case where it was calcified, stony hard in consistency. Majority of intraventricular meningiomas are fibroblastic, however this child had meningothelial variety but both are WHO type 1 and have little significance in term of prognosis. Since meningioma is slow growing tumour, it attains large size due to spacious ventricle cavity and considered as a silent tumour. Therefore clinical manifestations occur late and may happen in the form of compression of adjacent structures. Cushing and Eisenhardt described five clinical features of lateral ventricle tumours i.e. pressure symptoms with ipsilateral headache; contralateral macula sparing homonymous hemianopia; contralateral sensorimotor paresis, more marked sensory involvement, and numbness over trigeminal distribution; cerebellar involvement in more than half of patients; and paralexia, worsened by surgical intervention in left-sided tumours. The presentation of the present case was very rare and unique. The abnormal movement perhaps was due to large size tumour causing compression of ipsilateral thalamus and its nearby tract. Its hard calcified nature must have added in the compression effects of ipsilateral thalamus. Giant ventricular meningioma with size of more than 5 cm always has tendency to present by compression effect on nearby structure as in this case. He presented with this type of unclassified movement disorder which has been never been reported earlier in this age group. Brain tumours presenting as movement disorder is a very rare and happens to be due to compression of basal ganglia especially subthalamic nuclei. It can be due to direct mechanical compression or edema of tracts and surrounding structures. Vascular ischemia can be an additional factor which can happen in both mentioned causes. Bhotoe, et al described meningioma producing movement disorders like hemichorea and hemiballismus, involving one side of body, even they can produce hemiparkinsonism. Most patients who present as movement disorders due to brain tumour can have other manifestations such as raised intracranial pressure, altered sensorium, corticospinal tract involvements[6,7]. This patient had a mechanical compression most likely with superadded ischemic phenomenon too which recovered after 3 months. Had it been only mechanical compression, would have resulted in immediate recovery. To establish exact pathway involvement, functional studies like MR tractography may be helpful but its clinical utility needs to be explore more. Intra-ventricular meningioma in paediatric age group is a very rare entity. Movement disorder as a clinical presentation happens due to slow growth of tumour and compression of adjacent structures. Early detection and surgical excision can give good surgical outcome. 1. 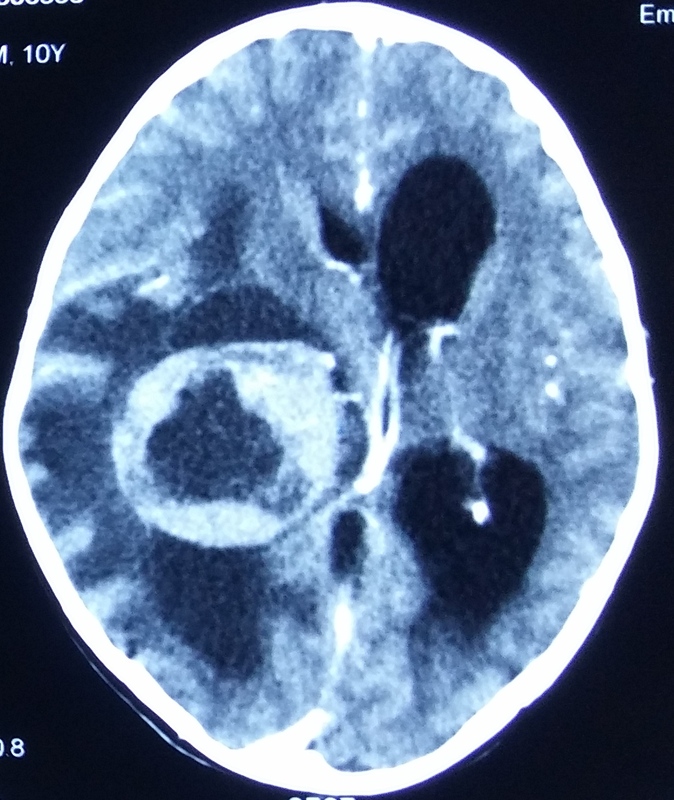 Ramraje, S., Kulkarni, S., Choudhury, B. Paediatric intraventricular meningiomas. A report of two cases. (2012) Australas Med J 5(2): 126-129. 2. Bhatoe, H.S, Singh, P., Dutta, V. Intraventricular meningiomas: A clinicopathological study and review. (2006) Neurosurg Focus 20(3): E9. 3. Bhatoe, H.S. Movement disorders caused by brain tumours. (1999) Neurol India 47(1): 40-42. 4. Cushing, H., Eisenhardt, L. Meningiomas. Their classification, regional behavior, life history and surgical end results. (1938) Thomas, C.C. Springfield pp 39-149. 5. Lyoo, C.H., Oh, S.H., Joo, J.Y., et al. Hemidystonia and Hemichoreoathetosis as an Initial Manifestation of Moyamoya Disease. (2000) Arch Neurol 57(10): 1510-1512. 6. 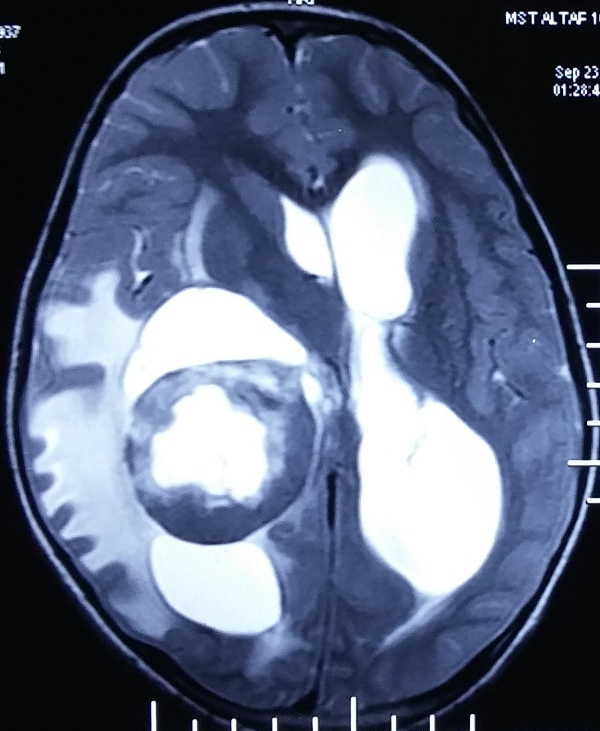 Ciurea, A.V., Vapor, I., Tascu, A. Intraventricular meningioma in 4 years old child: case presentation. (2011) Roman Neurosurg 18(3): 306-309.